The MICE Dialogue provides a platform for key stakeholders like the event organisers and suppliers to exchange ideas and stay abreast of the recent announcement on NRIC advisory guidelines to enhance consumer protection. Explore new opportunity with solution technology providers to enhance the business growth and competitiveness in compliance to the Personal Data Protection Act (PDPA).This dialogue also sees the Personal Data Protection Commission (PDPC) and SkillsFuture Singapore share how developing and deepening skills can accelerate growth and help individuals and businesses stay relevant in today's volatile economy. The Asia Business Meet brings together hand-picked buyers and invitation-only suppliers for strategic one-to-one meetings, results driven networking opportunities and dynamic team-building exercises. The Asia Business Meet focuses on fostering long-term relationships with major Asian MICE players. It aims to bring together pre-qualified buyers from Europe, North America, Asia and leading Asian suppliers of meeting and incentive travel for one day of pre-arranged, one-to-one meetings and non-stop networking. Abreast of our recent SMF 2017, we are bringing back another round of engagement that YOU love! A brand-new year allows for a fresh set of avant-garde concepts and innovating processes. Singapore MICE Forum was never simply a speaker-listener experience. It is and has always been a holistic platform that has never failed to entice our audiences through adaptation, collaboration, conversation and learning. The 4th edition of the Singapore MICE Challenge 2018 (SMC 2018) is a nationwide challenge for all students in the Post-Secondary Education Institutions majoring in MICE or Business Events, Business Management, Hospitality and Tourism related fields. 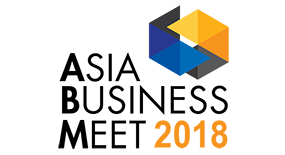 Organised by the Singapore Association of Convention and Exhibition Organisers and Suppliers (SACEOS), the only association representing the MICE & Events industry in Singapore, and in strategic partnership with the Professional Convention Management Association (PCMA), the Singapore MICE Challenge 2018 engages competing teams on their knowledge and understanding of the MICE and Events industry to create a successful business event. 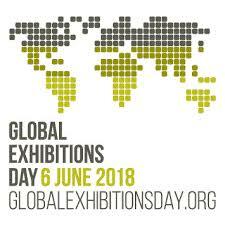 SACEOS celebrated Global Exhibitions Day on 6 June 2018 to comemorate the importance of the exhibition industry and highlight its positive impact on jobs, business, innovation and local investment. Online, and through an array of national and local events, people on every continent are expected to join the GED18 campaign, from venues and organisers to students, local partners and public authorities. 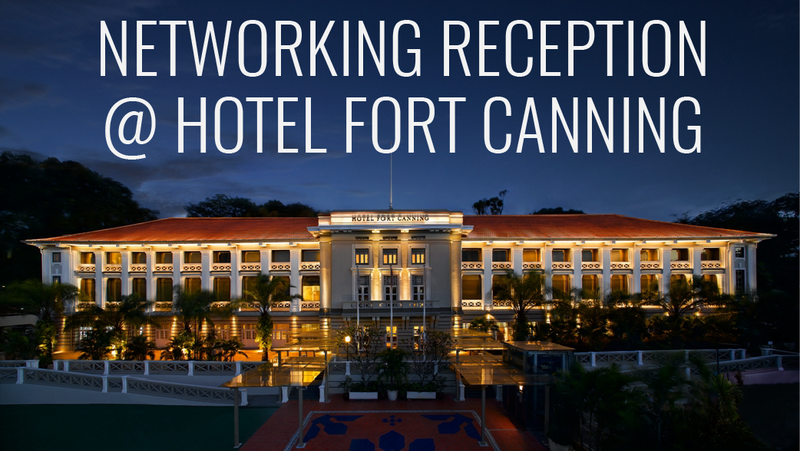 A relaxing evening in the tranquility of Hotel Fort Canning with cocktails and canapes that accompanied the conversations. Delegates were able to get a better understanding of the GDPR that will likely impact organisations in Asia and initial steps that they need to take to comply with the GDPR’s rules. 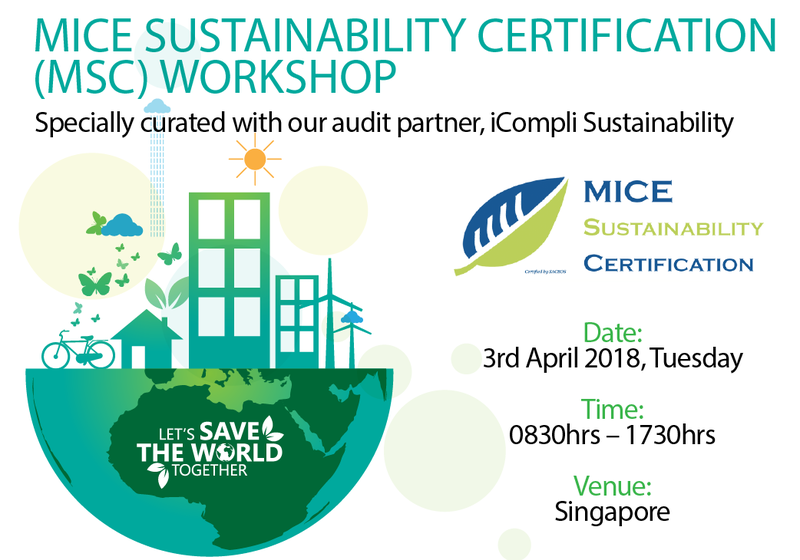 MICE Sustainability Certification (MSC) Workshop was successfully conducted on the 3rd of April 2018 with the presence of our audit partner, iCompli Sustainability (iCompli) a division of BPA Worldwide who is highly involved in developing and executing BPA audit protocols for sustainability standards from ASTM, ISO and GRI. The joyous occasion kicked off with a cocktail reception and guests were treated to a sumptuous buffet spread, accompanied with a wonderful performance as we wine & dine. 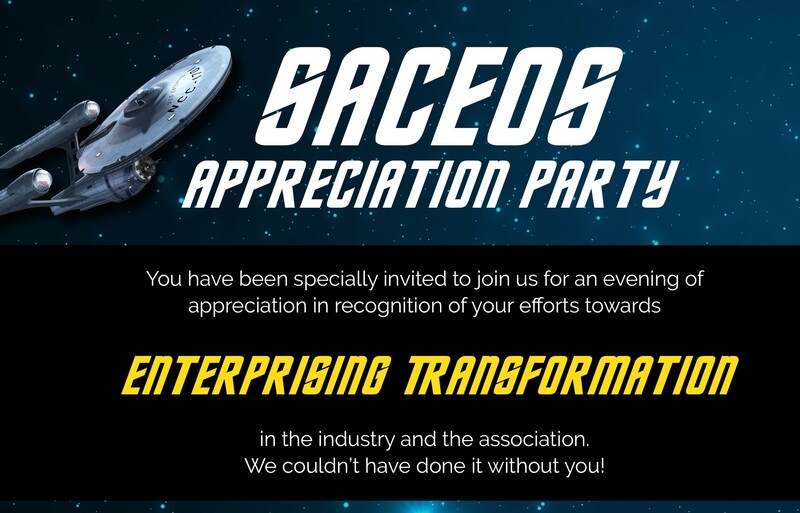 It was an eventful night at our SACEOS Appreciation Party 2018 as we had the opportunity to thank each and every one of our members, partners and supporters for their unrelentless support. SACEOS along with our industry peers such as students and practitioners, gathered to view the broadcast session as a community along with a sumptuous networking lunch reception at PSB Academy City Campus on 9 January 2018 from 11am to 3.30pm. 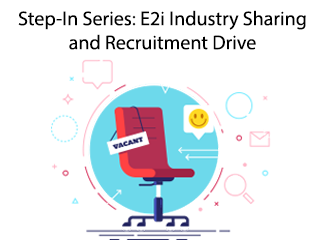 Step-In Series: E2i Industry Sharing and Recruitment Drive in collaboration with ITE College West. A sharing and discussion session that aimed to provide industry knowledge in areas such as entry, opportunities and progression to 120 graduating students from ITE College West. With the support of our Industry members, SACEOS was able to present several job vacancies from members' organisations to the students and guided them through their career development. SACEOS organised a briefing session in collaboration with IRAS with an objective to brief and seek industry members' inputs on the newly proposed Zero-rated GST treatment. IRAS went through the current GST treatment (where some local suppliers within the target group such as audio-visual and equipment suppliers might have zero-rated their services supplied to overseas exhibitors/organisers). IRAS proposal was to clarify that such services performed in Singapore should be standard-rated, and had a Q&A/feedback session to answer the queries from suppliers. An advocacy initiative by SACEOS to further its outreach to the younger audience who are currently majoring in fields that are related to the Business Events/MICE industry. Held annually in conjunction with the Singapore MICE Forum, SMC is organised as a nationwide challenge for all tertiary students majoring in MICE or Business Events, Business Management, Hospitality and Tourism related fields. 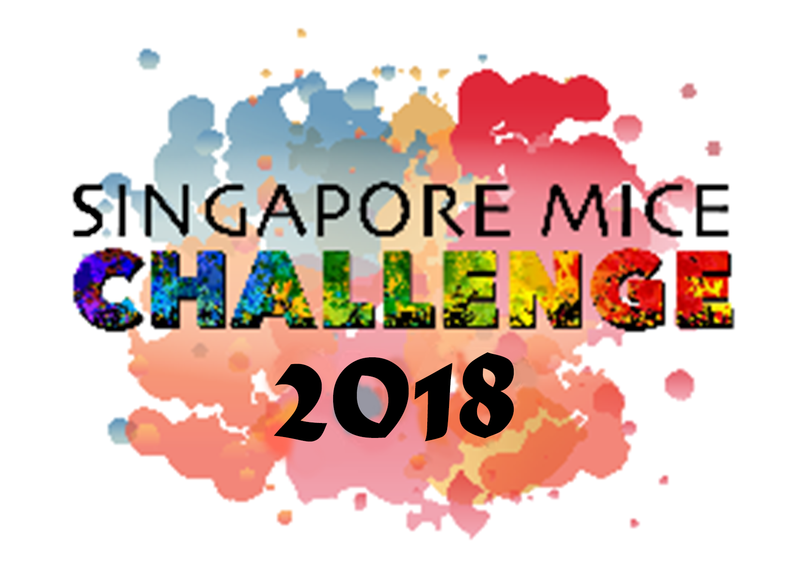 10 participating teams from various tertiary institutions that took part in Singapore MICE Challenge in 2017 with the chance to exhibit boldness in their creativity, fresh and unique ideas to MICE leaders and industry professionals. Aimed to bring answers to the question, “Are we really engaging?”, the strategic approach of the Singapore MICE Forum (SMF) held over two days in July 2017 has exceeded expectations. The event attracted 475 industry professionals across 26 countries, with other participants connecting remotely through live online streaming broadcast. SMF 2017 recorded the highest number of participants in its seven years of history, with about 48% of those who attended holding senior management positions. Jointly organised by SACEOS and Northstar Travel Group, the inagural Asia Business Meet (ABM) has been deemed a success with 49 international Meetings & Incentive buyers in attendance to exchange business conversations with Asian suppliers over the 2-day event. ABM brings together hand-picked buyers and invitation-only suppliers for strategic one-to-one meetings, results driven networking opportunities and dynamic team-building exercises. ABM focuses on fostering long-term relationships with major Asian MICE players. It aims to bring together pre-qualified buyers from Europe, North America, Asia and leading Asian suppliers of meeting and incentive travel for one day of pre-arranged, one-to-one meetings and non-stop networking. Global Exhibitions Day was held to celebrate the outstanding value of the exhibition industry, highlight its positive impact on jobs, business, innovation and local investment and sharing that with one single and cohesive voice. On 7 June 2017, SACEOS organised a networking reception for members and non-members to celebrate the GED2017. Held after the 37th Annual General Meeting, industry members stayed on for the networking dinner reception where a sharing session on MICE Sustainability and the streaming of PCMA Convening Leaders 2017Asia Delayed Broadcast were incorporated. In collaboration with some of the government agencies and organisations, SACEOS invited Singapore Tourism Board (STB), Workforce Singapore (WSG), SkillsFuture Singapore (SSG), e2i and more to share about the funding schemes and grants which they had respectively provided for the industry members to tap on in aspects of manpower/employment, professional development for staff and business solutions. Well attended by more than 150 industry members and corporates, SACEOS and KidZania Singapore had a fun-filled evening with plenty of business networking opportunies while they lived out their childhood aspirations on 28 February 2017 at KidZania Singapore! 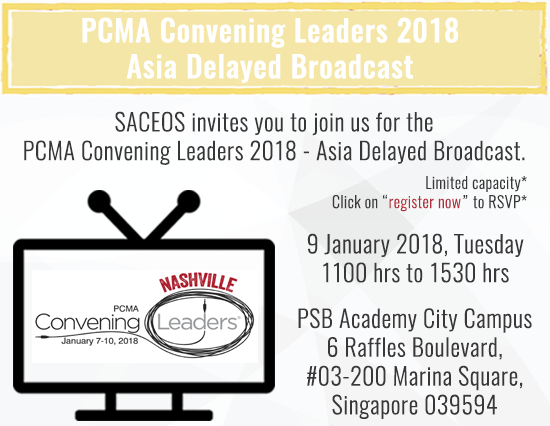 SACEOS invited a total of 120 industry members and students of Singapore Polytechnic to gather and watch the Asia Delayed Broadcast of PCMA Convening Leaders 2017. A networking lunch was also provided prior the broadcast session. 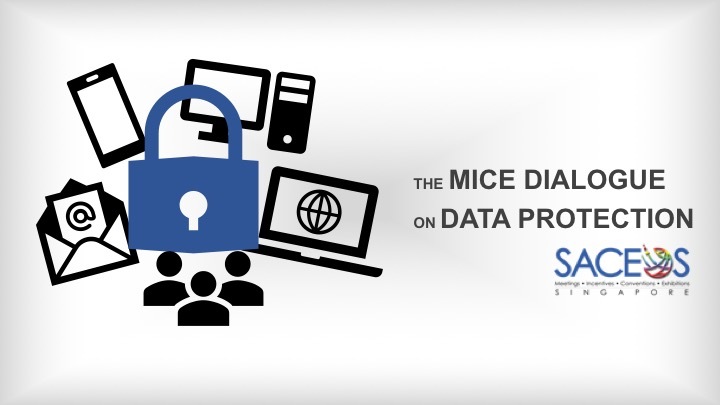 SACEOS invited representatives from the Personal Data Protection Commission (PDPC) to address industry members' concerns of how the Personal Data Protection Act (PDPA) affects the business operations in the Business Events/MICE industry. Representatives from PDPC also shared the relevant processes and policies for industry members' knowledge and implementation. This session was well attended by 105 industry members.